Despite the fact that approximately 50% of the estimated 150 Annona species known are native to Brazil, these local species are scarcely known and consumed in our country. On the other hand, the sugar apple and the sour sop are grown widely here and their popular appeal makes people consider them wrongly as native fruits. However the true native species does not share this popularity. Most of them are ranked low due to problems that include fibres, grittiness, poor taste, strong smell, too many seeds and small size. Among them, the Annona crassiflora, a large fruit from central Brazil with a good distinct flavour and a nice orange pulp colour, is considered to be the best one. The fruits from this genus where named aratikú (which means ‘heaven’s fruit’) by the Tupi-Guarani Indians. Nowadays, the names araticum and aticum are adopted in most Brazilian regions to designate them, including in some places the well known exotic ones. The observed trees reach a height of between 12 and 15 meters but Morawetz10 found in a rain forest, trees as high as 22 meters and Maas11 informed that the tree is 6-20 m tallwhile Pontes12 stated that the tree may reach 30 m. The trunk diameter is about 40 cm growing straight until 8-11 meters without any side branch. The canopy is 5-6 meters wide. Another particular aspect compared with most Annona species is the smooth light gray bark. The white wood is very light9 (density = 0.4). Young branches are glabrous and covered by many small light brown lenticels. Inside the cells of the root bark there are droplets of aromatic oil with an agreeable strong perfume9. The young buds are nicely covered by a brown velvety tomentum and the new growth changes during its development from brown to green. Petioles are 0.7-0.9 cm long and 0.2-0.3 cm wide and are grooved above. The leaves are probably the most remarkable characteristic of this species. They are alternated, thick, coriaceous, eliptic-obovate with an acute basis and a rounded or retuse, sometimes acute or even emarginated apex. Their size, 9-12 cm in length and 5-7 cm of width, matches Hoehne4, Safford6 and Correa7 descriptions but the leaves from one year old seedlings, planted in a rich soil and grown in a 60% shade house are bigger (16 x 10 cm). They are wider between their middle section and their extremity. Surface colour is different than the ones reported by Safford6 because his observations were made on dry specimens. The upper surface is glabrous, glossy and dark green and the margin is revoluted down as in Annona scleroderma. The lower surface is glabrous, and pale green. As a main aspect, the midrib, lateral nerves (8 to 12) and secondary veins on the upper surface are impressed. On the lower surface the midrib is salient but the lateral nerves and veins are slightly impressed too. The 2 cm wide calyx has three rounded concave lobes. Flower buds, solitary or in pairs, are ovoid to subpyramidal and acutish at the apex. 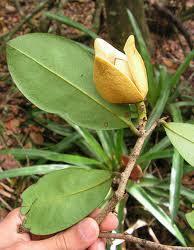 Its beautiful flowers bear a close resemblance to those of the Guanabani group (soursop, mountain soursop, soncoya…). They are arranged in 2 series of 3 thick ovate acute petals. The outer ones are valvate, 2.5 to 4.0 cm long and 2.0 to 3.2 cm broad and yellow on both surfaces. Their exterior is intensely covered by a fine and shiny brown tomentum that gives to the flowers a gorgeous bronze-silky appearance. The internal face base was deep purple stained making a nice contrast with the yellow background. The inner petals are valvate too, 2.2 to 2.5 cm long and 1.2 to 1.8 cm broad and covered by a fine velvety tomentum on both surfaces. The outside is yellow and the inside is bright pink changing into purple close to the base. The numerous cream-coloured stamens are 0.4 cm long. The fruit is almost unknown. Safford6 and Correa7 didn’t observe it but Hoehne4 and Fouqué5 ranked it as a very tasty fruit. Young fruitlets are green and they are clothed in soft prickles 0.5 cm long that get smaller, sometimes almost imperceptible, when mature. Fruits are globose and heart shaped. The ones I collected were 10 cm x 10 cm large weighting as much as 500 grams. Fruits cultivated in better conditions can reach as much as 20 cm as reported by Hoehne4 and Fouqué5. The rough skin, 0.5 cm thick, isn’t hard enough to prevent the attack of borers. As it ripens the colour changes from light green to yellow and dark yellow. Inside it there is a thin, grainy, almost tasteless layer close to the rind. The edible part is light cream-colour and, in the riper segments, almost translucent. It is soft, fiberless, grainless and agreeably sweet, reminding me of apples with a sapodilla touch. Seeds were bigger and more numerous in the larger fruits. The larger fruit had about 75 to 80 of them. They were hard, shiny and dark brown, ornate with longitudinal black stripes. Most of them were enveloped in a thin easily slipped off membrane. Their size was about 2.2 to 2.4 cm long, 1.0 to 1.4 cm wide and 0.7 to 0.8 cm thick, weighting 1.0 to 1.2 grams. The beach araticum is native to sandy areas of the Brazilian northeast coast. Despite its scarce occurrence, there are identified trees2 from Porto Seguro, the state of Bahia (16,4oS) to Igarassú, the state of Pernambuco (7,8o S). Pontes12 mentioned that it is very common at Paraiba state. The fact that the observed trees were situated 20 km far from the coast on a sandy-clay soil and close to an old farm might indicate that they were cultivated. The main characteristic of this area is the stable temperature where the annual temperature ranges between 18o and 33o C and the annual rainfall ranges between 130 and 170 cm with more than 80% of it concentrated from February to July. So far my preference has been to propagate the beach araticum by seeds. Despite their sandy native soil, I prefer to plant them in good, well drained soil. Most seeds start to sprout a pink stem in 5 weeks but some of them can spend as much as 3 months. The success rate has been about 80%. Seedlings growth, under 60% of shade, is very slow at the beginning. They seem to stand some drought but they present, when overwatered, some susceptibility to root rot. During the first year, they grow just 25 to 30 cm. This was the same height of the seedlings that I observed in the forest one year before. Now, after one year and half, they are 50 to 100 cm tall. Leaves of cultivated plants tend to be bigger than the ones observed in the forest. Even presenting a long taproot and poor lateral root development, one year old seedlings have been easily transplanted. They are showing good adaptation to full sun. 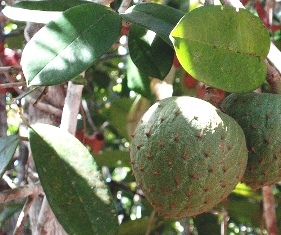 Unlike most Annona species, the beach Araticum isn’t deciduous during the winter. The trees I’ve observed were probably older than 50 years and they were grown without any care. However, my estimations of more than 100 flowers per tree, indicate that with appropriate conditions and pest control this species might be a heavier bearer than the soursop. These trees, located 8o S, flowered from September to December. The fruit ripens between January and March. Fruit harvesting can be a problem in old trees due to their height. Grafted trees and pruning would be a good option to prevent this. 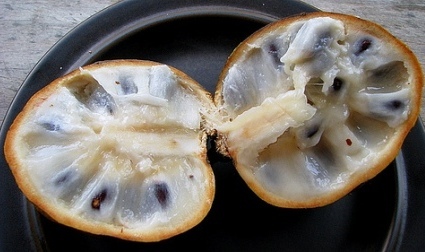 The main pest occurring in the observed trees was the Annona fruit borer (Cerconota anonella). The larva of this white moth damaged almost 100% of the non bagged fruits. One of the less attacked fruits had 14 holes in its skin. 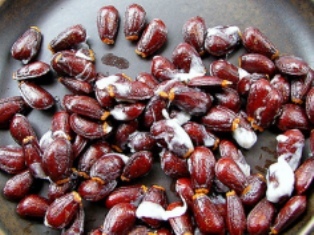 Its pulp and about half of the seeds were completely destroyed by the insect. These non developed fruits were about 3 to 6 cm in diameter and inside them there were both the larva and the moth. It was observed that a small ant, probably attracted by the sweetness of the fruit, was associated with the fruit borer attack, using the holes in the skin to reach the pulp and eat it. There were some mummified fruits around the trees, which consisted of just hollow shells. In a few cases the peduncle had been attacked by white scales. Despite the severity of the fruit borer attack, the other parts of the plants looked healthy. In my opinion, the high quality of its pulp flavour and texture in addition to the beautiful aspect of its foliage and flower indicate that the beach araticum could be spread as a garden tree. The sweetness of the pulp, good flavour and softness could be good characteristics to be reproduced in hybridisation. 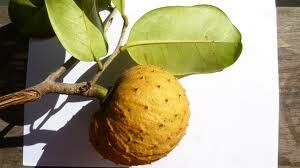 It must be considered that, except for the soursop, most fruits from the Guanabani group lack these properties. Safford, wrote in his revision of the genus Annona: ‘It is strange that this quite distinct and valid species is absent from more recent collections of plants from its native region’. Today, more than 80 years later, this situation is probably worse. Even considering that I obtained no more than 60 viable seeds, I began to propagate them, starting a process that I hope will bring this valuable fruit back from the brink of extinction.